The show notes to go with Show 82 of our technology radio show. More Freeview HD channels: On the plus side, to help the migration to Freeview HD, up to 10 new HD channels may be advertised by Ofcom - although as there were no takers for the 5th Freeview HD slot, it's not clear who'd take them! Interesting times ahead. Sky+ on the iPhone: Next, Sky+ users with an iPhone, iPad or iPod Touch note that the new iOS app now lets you control your box over wi-fi. Change channels, fast forward, and best of all, manage existing and future recordings. Available from the App Store now. Updated iTunes: In other news, a redesigned iTunes was released in November 2012. iTunes 11 has a "mini view" and "up next" feature, plus a new-look store. 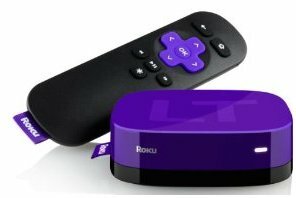 Now TV now on Roku: Sky's new on-demand movies service "Now TV" is now available on the £49 tiny Roku 2400 media player. The Roku also offers Netflix, the BBC iPlayer and has wi-fi - handy for anyone without an Internet-enabled TV. Apple and Android Watches: Rumours of an Apple iWatch continue to trickle into us here. 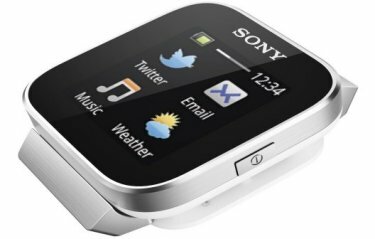 There's already an Android one, the Sony LiveView SmartWatch, which pairs with Android phones and has dropped to a bargain price of £65. Other Rumours: Other rumours last month include the arrival of Microsoft retail stores in the UK, no doubt pushing the rather odd Windows 8 upgrades, and we've also heard that an iOS Google Maps app isn't that far away, to placate all those whose maps have been downgraded free of charge by Apple. And Finally: Regular listeners to local radio will be familiar with their station's jingles. From next year, there'll be a radio station dedicated to jingles of today and yesteryear. JingleMadRadio is testing now, and you can listen at jinglemadradio.com - Great for anoraks and enthusiasts, the station has secured permission from the world's leading jingle makers, and also carries top-of-the-hour jingle news. VIDEO MONTAGE - Kelly and Pete at Gadget Show Live!! This is from Thomas: "I am a 83yr old Pensioner, and have had a new Smart Meter installed. It seems to be showing a higher than normal use. Are there any meters, not too expensive, that I can use to monitor actual use of power used, other than EDF fitted meters." There are no domestic products you can buy to monitor your gas consumption, so you'll have to trust the smart meter. As for electricity, there are several power monitors you can get. These typically have a transmitter which clamps onto one of the leads connecting to your incoming electrical supply, and a receiver with a screen to show consumption. As they're using inductance, they're not going to be as accurate as the home's electricity meter, but it will give you an idea. Oh - and still no news on when British Gas will be installing our smart meter, so we can put it to the test. Shame. Andy Berry says: "How's your weather station doing? You may be interested in my web site at weather.dragontail.co.uk. The weather data is driven from a Raspberry Pi connected to the Maplin USB weather station. It can be left on all the time for minimum cost and uploads to the web site every 10 mins. The software is python based and instructions on how to configure are on my web site." Well worth a look. At the moment, our Pete is using a Watson wireless weather station and Cumulus software to upload data via a PC to the net via a PC. More on our Weather Station page. Darren Ney asks: "Is it true that Microsoft will be doing away with windows live messenger by Easter text year and replacing it with Skype? Windows Live Messenger is far better." As we reported in the news section, Microsoft bought Skype in 2011, and the company is now putting its efforts into Skype as their main tool. Windows Live Messenger, formerly MSN Messenger, has 100 million users, and they'll be able to import contacts into a new version of Skype to make the transition easier. Please Use Our Amazon Store! When you're shopping at Amazon please use the link frequencycast.co.uk/amazon - It won't cost you a penny more, and shopping via our Amazon shop helps to pay for our running costs! Got a comment or question? You can leave us a voicemail by calling 020 8133 4567, or sending us a message. We'd love to hear from a few more of you, so please get in touch and say "hi" - our shows are driven by your feedback - So talk to us! Want new shows as soon as they're released?